Happy Valentine’s day! 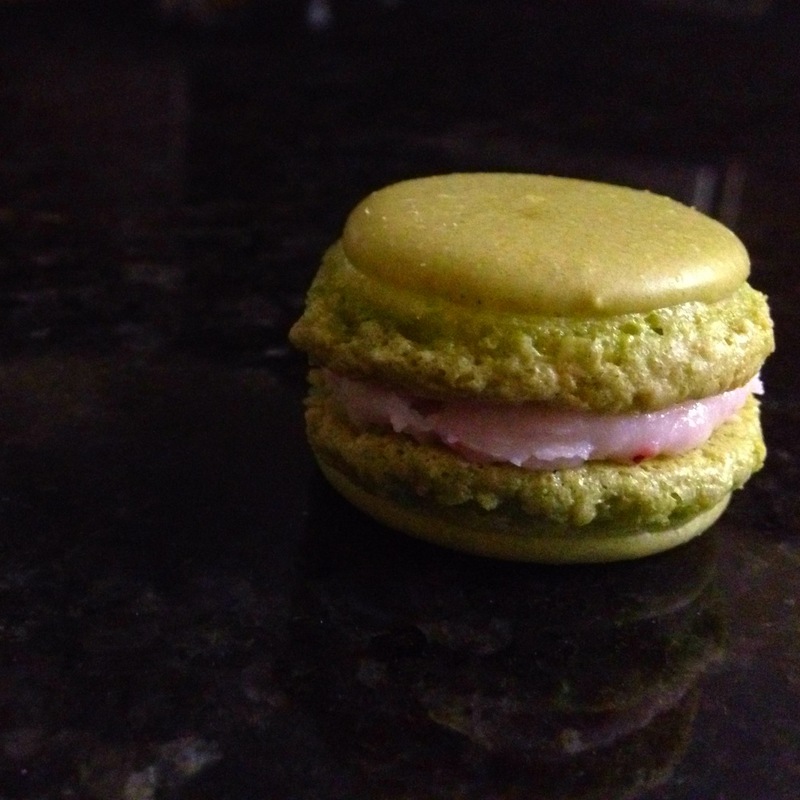 Today, I’m sharing my strawberry matcha (green tea) macaron recipe. The matcha flavor offsets some of the sweetness of the macaron shells, and when combined with just a hint of strawberry flavor in the filling, these macarons are so perfect. This is definitely my favorite macaron recipe so far. What’s your favorite? If you’re new to making macarons, please also read my previous post for some tips and tricks. Line two medium baking sheets with parchment paper. In a medium bowl, sift the almond mixture. In a small bowl (be sure to use a bowl that’s not too shallow), whisk the egg whites with a handmixer on medium-low speed for about a minute until light and fluffy. Gradually add granulated sugar to the egg whites while continuing to whisk on medium-high speed for another 2 minutes. Gradually fold the egg mixture into the almond mixture, adding only about 1/3 of the egg mixture at a time. Add matcha powder and fold. Pipe batter onto baking sheets. Try to pipe small rounds that are just under 1 inch wide and at least 1/2 inch apart. Preheat oven to 325°F. Let the batter sit at room temperature for about 15 to 20 minutes. Turn the oven down to 300°F and put the baking sheets into the oven for 7 minutes. Rotate the baking sheets and bake for 8 minutes. Remove the baking sheets from the oven and allow the macaron shells to cool. Rinse 2 large or 3 medium strawberries, hulled and cut into halves. In a small oven-safe glass pan, bake strawberries for about 10 to 15 minutes. Mash the strawberries and drain the excess syrup. You only need about 2 1/2 tsp of mashed strawberries. Sandwich just a small dab of filling between two macaron shells – you can pipe the filling or just gently spread the filling with a spatula. Trust me, it tastes just as good as it looks. Categories: art, baking, deliciousness, edible art, food, french macaron, macarons, om nom nom | Tags: baked goods, baking, food, french macarons, green tea, macarons, matcha, recipe, strawberry | Permalink. I will attempt these and let you know how it goes! Eeeesh! Looks so difficult. Hey S! Yes, please let me know how your macarons turn out!